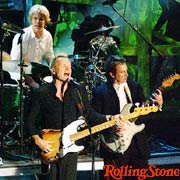 The Police played on March 10 2003 to the ceremony for the induction in the Rock 'n' Roll Hall of Fame. The band rehearsed for two days in the previous week-end at SIR Studios, playing only the instrumental parts to preseve the voice of Sting!!! The prizegiving was carried out by Gwen Stefani, singer of No Doubt and long-time Police fan, and subsequently Sting, Andy and Stewart keep some speeches. Sting thanked Miles Copeland and Kim Turner and says that the Police didn't play for 18 years, but that was the occasion to play, not to speak about it. The trio, accompanied by the backing vocalists Katreese Barnes and Take Dyer, have played three of the most well-known songs of their carreer: Message In a Bottle, Roxanne and Every Breath You Take. For this song they were joined onstage by Gwen Stefani, Steven Tyler (Aerosmith) and John Mayer.